Last night after feeding the kids and sending them off to play in the streets I retired to the couch and watched a TV show about tiny houses. It was the first time in months I had not spent the whole evening (and well into the late night) seated at the dining room table hunched over my computer working on my book. Writing this book has consumed my life for the last four months. I have used every available child-free moment to collect stories, edit old blog posts, write new stories, edit, rewrite, edit, rewrite, edit, rinse and repeat. Because I have two small children and a full-time job the majority of my writing and editing has occurred between the hours of 8 p.m. and 1 a.m. After a day of adulting in the real world I am pretty much useless by the time 8 o’clock rolls around. Consequently, most of what I write in those first two hours is craptastic on an epic scale. I would typically experience a creative reboot sometime around 10 p.m. with this artistic resurgence carrying me through to approximately midnight. It was during this brief window of time that I did my best work. Shortly thereafter I would meltdown — creatively and emotionally — and if you were to read anything I had written post-midnight you’d swear I was on acid. Or a mental patient. I can be a bit obsessive and some nights I would hyper focus on a single word, convincing myself that it was the wrong word and that said word was ruining not just the sentence but the entire book. Thesauruses would be enlisted and when that failed I would ask Todd to tell me what word I actually meant and when he failed to read my mind I would scream at him for not being better than my thesaurus. Poor Todd. Several other prominent writers have committed to review the book as well. The response has been promising. But for now I wait until August 24, 2015 when the book is published. I cross my fingers that people beyond my circle of friends will read it. Of course I hope that the book will reach a wide audience. I believe that it is a story “for anyone, a story of true love, commitment and what it means to be a family in the US in 2015” because this book is “enlightening to gay and straight families alike”. Which One of You is the Mother? 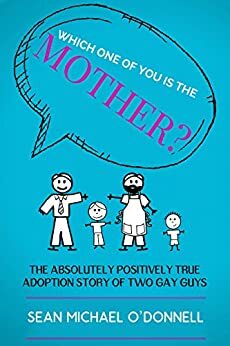 is available for pre-order on Amazon: Buy Which One of You is the Mother? here. No seriously, buy it now. It’s only $4.99. A venti Starbucks Frappuccino costs more and unlike that Frappuccino this book won’t make you fat(ter).